“Největější Trojice” church is located on the hillock just near the town square and it is the top class monument. 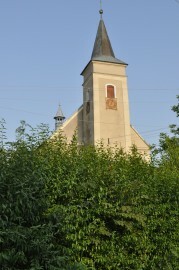 The church was built in a Baroque style between 1701 – 1706 on the place of the original church. Its founder was a count Leopold Karel Sedlnický, an Austro-Hungarian chancellor of a close Linhartovy mansion. In the first half of the 18th century a fire damaged the church, however local people managed to renovate it very quickly. 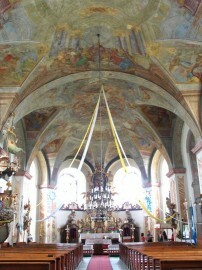 In the interior, unique monuments of a Silesian folk art, such as frescoes from 1733, a Rococo baptismal font, A Rococo font of a ship shape from 1771 or an epitaph devoted to the church founder, who died in 1731, made of white, red and black marble. In its centre there is a notice, at its top, a blazon of Odrowaz tribe and a portrait of person deceased are placed. In the church there is also an organ from 1763. There is a collection of paintings and sculptures from 15th century, among other capturing St. Dorothy and St. Barbara. Opawica, a village on Zlatá Opava river, was first mentioned in 1256. The village belonged to crusaders of Opava at that time. Later it belonged to princes of Opava and Hlubcice. At the end it belonged to local nobility, among other the owners of Linhartovy mansion. The village used to be a country town, indicated by a square-shaped square. Polish Opawica and Czech Opavica lying on the opposite side of the river, used to be one village, but after Silesia being conquered by Friedrich II the Great, Opava river became a bordering point. Gottfried Riger (1764 – 1855), who was a famous composer, was born in Opawica. 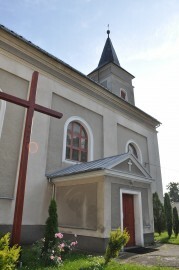 Holy Mass on Sundays and holidays shall be held at 11:00 Opawici, at 8:30 in Chomýž.